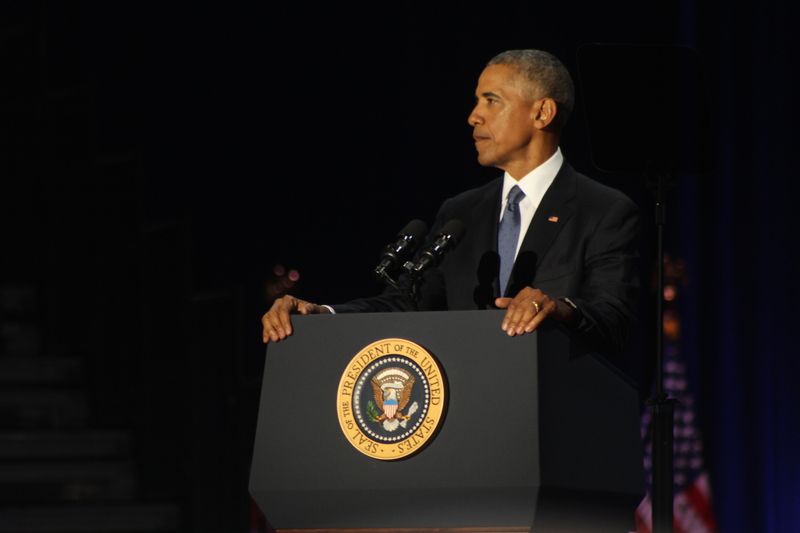 President Barack Obama gave his farewell speech at the McCormick Place in Chicago. The energy was frantic, joyous and anticipatory. Eight years have flown by. Our first Black President along with his family demonstrated a class and resilience that embodies the spirit of Black people. As our 44th president was introduced to the stage and the crowd of ten thousand plus roared for him you could sense a guarded relief from our Commander and Chief. He was there to get through his speech and say his final goodbye with as least amount of fanfare as possible. His deliverance was tempered. There was a surgical precision to how he made sure to touch base with almost every aspect of American life. The reality of what is upon us all came when he acknowledged the First Lady. President Obama knows he could not have done this with out his wife. This woman from the South-Side of Chicago was his rock and represented the country in a way that will not be rivaled for years to come. Michelle is strength, poise, elegance and power. I think many of us wanted that moment where President Obama throws caution to the wind and says what he really feels. We wanted him to hold the United States fully accountable for the atrocities of slavery. We wanted him to speak directly to the communities of Chicago that have been victims of rampant gun violence and the scourge of death that seems unending. We wanted him to say something that had to do with us. It didn’t happen and we understand why. Obama has truly been a president for all people. President Obama has accomplished many things in his eight years. He lifted the United States out of a depression. The largest percentage of the country to ever have health insurance is a result of his administration’s hard work. If he were to be remembered for just those two accomplishments it would be fitting. However, the two most impactful accomplishments of President Obama was being a Black face holding the highest position in the land and being able to survive 8 years and not being harmed. President Obama’s speech was exactly what it should have been, but the tear he shed for his wife when he said her name showed us what it really is, he sacrificed his family in the attempt to unify a nation. We honor him for that. This entry was posted in Uncategorized and tagged Barak Obama, Chicago, Farewell, McCormick Place, president, White House by Precise. Bookmark the permalink.